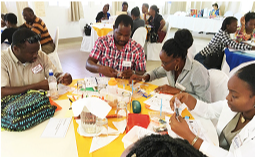 On March 29-30, 2017 The Caribbean Science Foundation (CSF) and the Caribbean Academy of Sciences (CAS) collaborated to host a STEM (Science, Technology, Engineering and Math) Teacher Training Workshop for primary school teachers at the Bird Rock Hotel in St. Kitts. This two-day workshop served a total of 29 teachers from St. Kitts and Nevis, Antigua and Barbuda, Barbados, Grenada and St. Vincent, and was made possible by grant funding from the Embassy of the United States of America to Barbados, the Eastern Caribbean and the OECS, as well as through the cooperation of the Ministry of Education of St. Kitts and Nevis. The goal of the STEM Teacher Training Workshops is to train teachers in the use of Problem Based Learning (PBL) and Inquiry Based Science Education (IBSE) as teaching tools. The teachers were selected by their relevant Ministries of Education, and are among those who have a passion for increasing their students’ level of interest in the sciences. These teaching methods covered in the workshops are intended to introduce the basics of the scientific method to young students, and promote their interest and excitement in science and engineering. A longer-term goal of the STEM Teacher Training Workshops is to increase the number of students focusing on the sciences at the secondary level. Along with the introduction of UNESCO-approved micro-science kits, emphasis was placed on PBL/IBSE using readily available, familiar materials, to which children can relate. The training was provided by experienced CAS facilitators, including Dr. Winston Mellowes – Professor Emeritus, UWI St. Augustine, Dr. Rowena Kalloo – UWI St. Augustine, Ms. Petal Jetoo – National Science Coordinator Ministry of Education Guyana, Professor Theodore Lewis – Professor Emeritus, UWI St. Augustine, and Professor Bhuall Nand Kumar – NYIT. Mr. Olston Strawn, Science Coordinator in the Ministry of Education in St. Kitts and Nevis aided setting up the many and varied experiments demonstrated to the participants. Workshop_composite_image_St_Kitts.jpg In his speech at the opening ceremony, the Hon. Shawn Richards, Deputy Prime Minister and Minister of Education, Youth, Sports and Culture urged the participants to take advantage of all the information offered, and to enthusiastically transfer that knowledge to their students. He also expressed his interest in seeing how some of the workshop materials could be used, and thanked the facilitator team for bringing creativity and innovation to the classroom. Professor Cardinal Warde in his remarks reminded the teachers of the important role they play in shaping the Region’s future by fertilizing the young minds so their students grow up to love science and engineering, and use STEM to build new economic pillars for the Region. On the final day of the workshop, the Permanent Secretary in the Ministry of Education, Mr. William Hodge, commended the team of facilitators for their exciting and interactive syllabus, and suggested to the participants that they should begin to implement their new knowledge in their classrooms at the earliest opportunity. Each teacher received a certificate of participation and a micro-science kit for use in their respective schools. Feedback from the participants was very positive, and encompassed requests for longer and more frequent workshops of this nature.